We aimed to assess whether healthy eating lowers the risk of CVD and all-cause mortality in cardiac patients, since little is known about dietary scores and mortality risk in cardiac patients who are treated well with drugs (with a relatively low risk of cardiovascular diseases (CVDs)). For this assessment, we created two dietary scores: the Dutch Healthy Nutrient and Food Score (DHNaFS) and the Dutch Undesirable Nutrient and Food Score (DUNaFS). 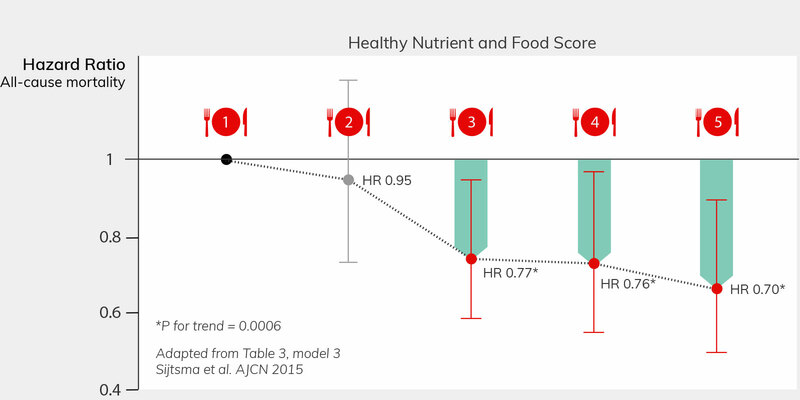 The associations of both dietary scores with CVD and all-cause mortality were assessed by using multivariable-adjusted Cox regression models. Participants were part of the Alpha Omega Cohort. Read more about the AOC population. During a median 6.5y of follow-up, 801 patients died; 342 of those died of CVD. The Dutch Healthy Nutrient and Food Score (DHNaFS) included 11 nutrient-dense food groups: vegetables, fruit, whole grains, protein-rich plant foods (mostly legumes), potatoes, lean meat, fish, eggs, low-fat milk and yogurt, oils and soft margarines, and noncaloric drinks. The Dutch Undesirable Nutrient and Food Score (DUNaFS) included 13 food groups that were high in solid fats, sodium, and/or added sugar; processed fruit, high-fat meat, processed meat, full-fat milk, cheese; refined grains, butter and hard margarines, soups, spreads, ready-to-eat meals, savory snacks, sweet snacks, and sugar-sweetened beverages. We found that the patients consumed a substantially higher average amount of DHNaFS foods (∼1750 g/d) than DUNaFS foods (∼650 g/d). Patients in the fifth quintile of the DHNaFS had a 30% lower CVD risk and a 32% lower all-cause mortality risk than did patients in the first quintile. The DUNaFS was unrelated to both CVD and all-cause mortality. To conclude, beyond state-of-the-art drug treatment, healthy eating was associated with a lower risk of CVD and all-cause mortality in cardiac patients. The Dutch Healthy Nutrient and Food Score (DHNaFS) was associated with a 30% lower risk of all-cause and CVD mortality when comparing the extreme score quintiles. Beyond state-of-the-art drug treatment, healthy eating was associated with a lower risk of CVD and all-cause mortality in cardiac patients. Sijtsma FP, Soedamah-Muthu SS, de Goede J, Oude Griep LM, Geleijnse JM, Giltay EJ, de Boer MJ, Jacobs DR Jr, Kromhout D.
Am J Clin Nutr. 2015 Dec;102(6):1527-33.